The Miss World contestants were interviewed as part of the judging process of the pageant. In the video above you can watch the highlights of the not-so-easy process. A group of contestants of Miss World 2011 participated today in a photo call near the shores of River Thames right in front of the Marriott London County Hall. In the photo above, the contestants from Argentina, Brazil, Chile, Venezuela, Colombia and Puerto Rico pose for the cameras. After the photo call, the contestants went to the famous London Eye to watch the panoramic view of the city and its surroundings. Don't forget to check the updated photo galleries! For the second year, The Times of Beauty created a scorecard to have an idea of how the contestants are doing in the fast-tracks. The points were assigned under our own criteria (described below) and they are NOT the official scores from the judges nor they have any influence on the pageant. This is just for fun! -No contestant placed in all five out of the five fast-track events. -2 contestants placed in four out of the five fast-track events: Puerto Rico and Sweden. -13 contestants placed in three out of the five fast-track events: Argentina, Barbados, Bolivia, England, Guatemala, Kazakhstan, Latvia, Paraguay, Philippines, South Africa, Ukraine, United States Virgin Islands, Venezuela and Zimbabwe. -22 contestants placed in two out of the five fast-track events. -73 contestants placed in at least one fast-track event out of the five. 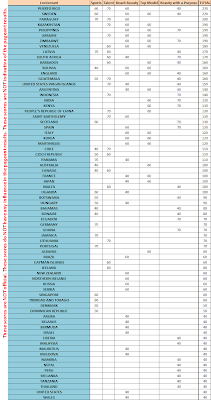 -11 contestants placed in the Top 20 of both Beach Beauty and Top Model: Bolivia, England, Kazakhstan, Korea, Italy, Martinique, Philippines, Sweden, Venezuela, Ukraine and Zimbabwe. -5 contestants placed in Beach Beauty, Top Model and Beauty with a Purpose: Argentina, England, Philippines, Sweden and Zimbabwe. -10 contestants only placed in the Beauty with a Purpose Fast Track. 80 points will be awarded to the second runner-up, 90 points to the first runner-up and 100 points to the winner in all categories when they are revealed. 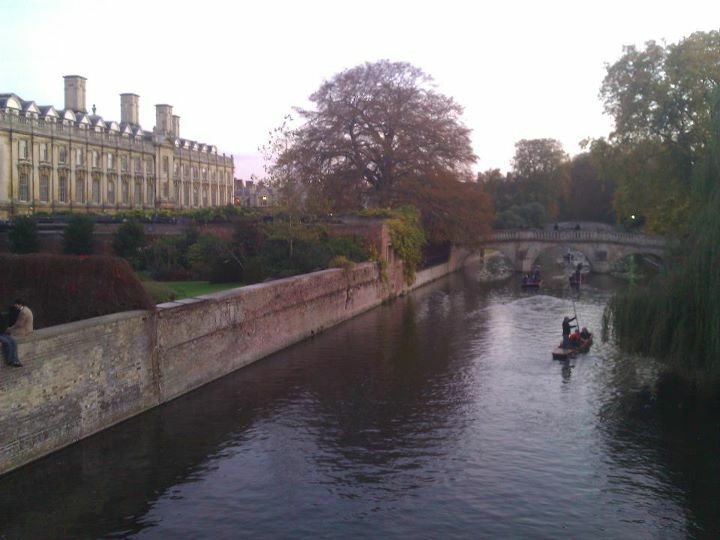 The 113 contestants for Miss World 2011 spent their day at the University of Cambridge, the second oldest university in both the United Kingdom and the English-speaking world. A group participated in a walking tour of the campus that took them to St John's and Trinity College and another group were punting on River Cam. A select number of the contestants participated in presentations or debates at the university. The contestants from Botswana, Puerto Rico, Scotland, and Zimbabwe gave presentations. 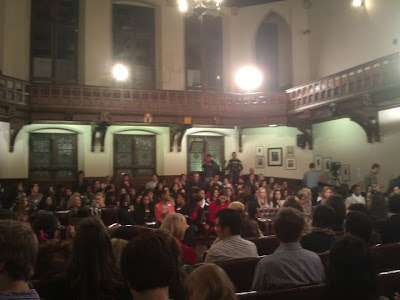 The contestants from Spain, South Africa, Namibia, Liberia, Ireland, Paraguay, India, Nigeria, Botswana, Australia, England, Dominican Republic, New Zealand, Sierra Leone, Mauritius, Belgium, Panama, Saint Barthélemy and the People's Republic of China participated in debates surrounding social responsibility and other topics. Zimbabwe was the first speaker to take the floor. Her speech was about her work helping the fight against the cholera epidemic in her country as well as the importance of Beauty with a Purpose. Botswana took the stage and gave a speech about tolerance and dispelling misconceptions. Scotland talked about the inspiring work of the contestants through Beauty with a Purpose and highlighted the academic backgrounds of her fellow contestants. Puerto Rico talked of her work with the children in her home country and how much she has learned from the Miss World experience. 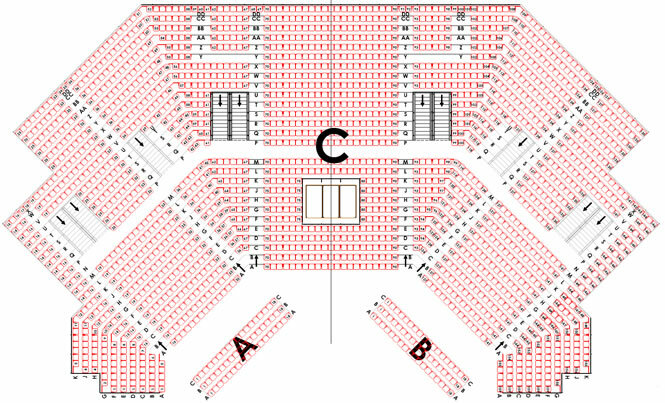 If you have your ticket for Miss World 2011, you may find out where your seat is located at the Earls Court Two in the plan above. Paraguay, Lithuania, Guatemala, People's Republic of China, United States Virgin Islands, Kazakhstan, Saint Barthélemy, Indonesia, Puerto Rico, Ukraine and Chile. 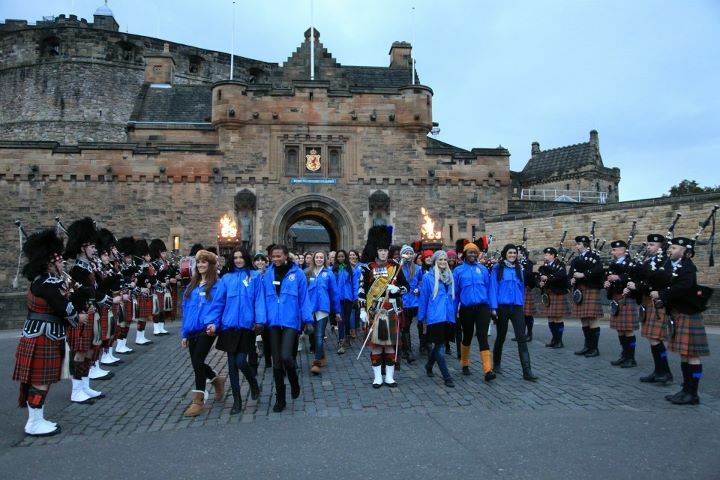 Check out a video with the highlights from the Edinburgh Castle visit! Atong Demach, Miss World South Sudan 2011, officially withdraws from Miss World 2011 due to visa problems as previously reported exclusively at The Times of Beauty. She received her visa today but since it is late she will go instead to Miss World 2012. The 113 contestants for Miss World 2011 had a special dinner at the Crieff Hydro Hotel where they had a taste of Scottish cuisine on Tuesday night. On Wednesday, the contestants visited the British School of Falconry at Gleneagles to learn about and watch birds of prey. They also visited the Edinburgh Castle nestled on top of Castle Rock overlooking the city to discover more about the history of Scotland. At night, they had a Melville Market dinner held at the Crieff Hydro Hotel Ballroom. The contestants depart to London on October 27. 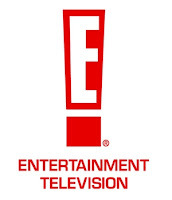 Miss World 2011 will be broadcasted LIVE in the United States on E! Entertainment Television on November 6. As reported exclusively on The Times of Beauty couple of days ago, the contestants from Angola and Guyana officially withdrew from Miss World 2011 as a result of visa problems. They join the contestants from Ethiopia and Cape Verde who withdrew as well because of the same problem. Guyana's Arti Angelita Cameron will go to Miss World 2012. 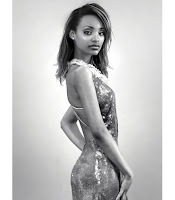 Visa problems with Miss Cabo Verde, Tirzah Évora. The director of Miss Cabo Verde initiated contacts with the embassy of Cape Verde in Dakar, but was informed that the candidate would have to move and stay 15 days in the capital of Ghana, a country where Britain has diplomatic representation. Neither the organization nor the candidate had or have availability and money to spend two weeks in Accra. The Cape Verde Embassy in Dakar was requested to expedite the process to no avail. Miss Cape Verde tried to travel to Dakar, but the ambassador said that was a waste of time, since only in Ghana there is a diplomatic representation in England. 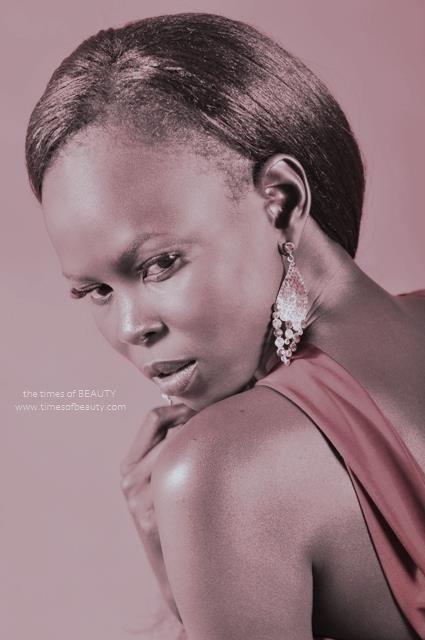 Due to the situation, Tirzah will be sent to Miss World 2012. Edmilza dos Santos will not arrive to London because of visa problems. This is the second time Angola misses the pageant since its debut in 1998. Besides Cape Verde and Angola, there are no signs of the contestants from Armenia, Lesotho, Suriname and Zambia in London. Guyana and South Sudan as mentioned in a previous article, do not have visa for the United Kingdom. If none of these contestants arrive, 113 contestants would compete in Miss World 2011 and the 2010 record would not be broken. 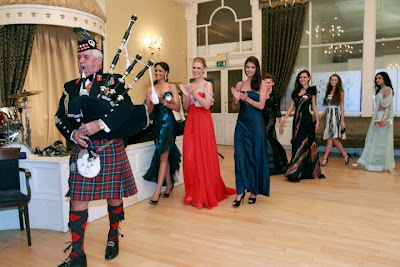 The Miss World Sports event was held at the surroundings of the Crieff Hydro Hotel. 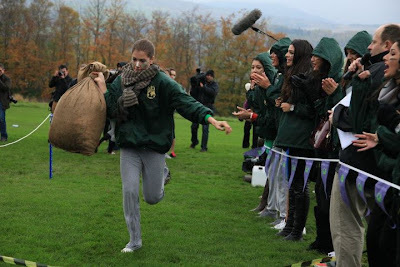 The challenges were part of the Miss World Highland Games where contestants took part in a series of Scottish challenges. The blue team comprised by the representatives from Panama, Paraguay, Germany, Jamaica, Latvia and Portugal were the gold medalists and therefore the winning team. The orange team comprised by the representatives from Trinidad and Tobago, Puerto Rico, Sweden, Singapore, Uganda and Scotland finished in second place and were the silver medalists. The green team comprised by the representatives from Czech Republic, Guatemala, Dominican Republic, Denmark, Hungary and Botswana finished in third place and were the bronze medalists. The red team comprised by the representatives from Bonaire, Australia, Bahamas, Canada, Chile and Bolivia finished in fourth place. The six winners from the sprints (six different groups, the winner from each group) were Trinidad and Tobago, Paraguay, Dominican Republic, Latvia, Uganda and Scotland. After the British Embassy did not approve a visa for entering the United Kingdom for Ethiopia's Melkam Michael Endale, she officially withdrew from the 2011 Miss World competition. 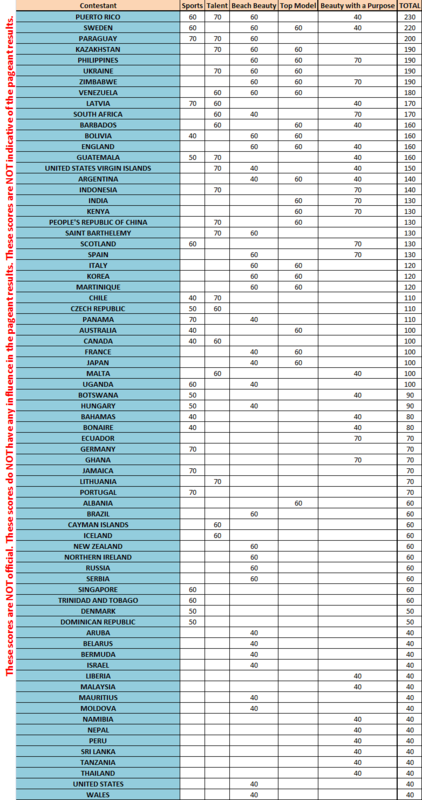 The entry to the United Kingdom and the United States can be a difficult process in several countries due to the fact that several young woman have not returned to their countries. Endale will compete in Miss World 2012. We thank national director Gadol Wilson for sending us the information. She is not the only one. Miss Guyana World 2011, Arti Angelita Cameron, is still to receive her visa. Cameron had applied online immediately after receiving the required sponsorship letter from the Miss World Organization and subsequently supplied her biometric information, but she has to wait for a response from the British Embassy. All sides involved continue to do everything in their power to have Cameron represent Guyana at Miss World 2011. Contact has been made with the Guyana Foreign Affairs Ministry and the Guyana Consulate in the USA for assistance in resolving the situation. In case she does not get approval, she will be competing in Miss World 2012. Miss World South Sudan 2011, Atong Demach is in Nairobi, Kenya also waiting her visa to be approved in order to get entry to the United Kingdom. The South Sudanese government is collaborating in the process. On October 19, most of the contestants of Miss World 2011 arrived to London to participate in the international event. 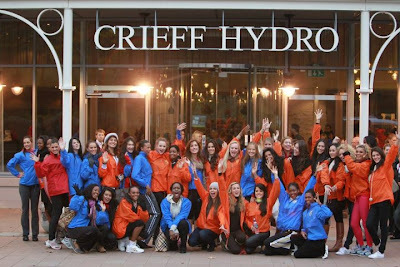 For the first segment, the contestants are staying at the Sofitel London Heathrow Hotel where they are taking part in meetings, photo shoots, filming, rehearsals and the selection of the contestants that will move further in the fast track events. On October 20, the Miss World Talent search began. The girls rehearsed their talent numbers with unique outfits and the day followed with the actual talent auditions. On October 21, the contestants were filmed for their video profiles and the first Miss World Sportswoman tryouts took place to narrow down the number of contestants that will take part in the fast track event. So far, the event has been silent and secret inside the facilities of the Sofitel London Heathrow hotel. You can visit the photo galleries to follow the activities taking place in London. Jamaica is the largest English-speaking island in the Caribbean and the third largest in the region. With a total land area of 10,991 sq. km, the island is 235 kilometres long with widths varying between 35 and 82 km. Situated south of Cuba, Jamaica is divided into three counties, Cornwall, Middlesex and Surrey. These counties are further subdivided into parishes with Kingston, the smallest of the 14 parishes, as home to the capital city. The terrain is very mountainous with much of the land rising above 305m. The highest point, Blue Mountain Peak, is 2,256 m above sea level. Complementing the mountains, Jamaica also brims with valleys and plains. The five major plains – Vere, St Jago, George’s, Liguanea and Pedro – provide the backbone for a largely agricultural economy. 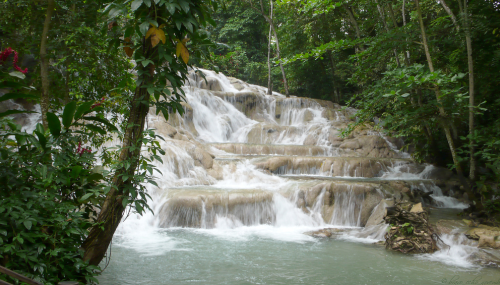 Natural rivers and springs abound in Jamaica. Over 120 rivers flow through the land from the central mountain region to the coasts. The rivers on the north side tend to be shorter and swifter than those on the south side. The fast flowing rivers – Black River, Rio Cobre, Milk River, Rio Grande and Martha Brae - are used for transport and the production of electricity as well as to provide irrigation for agricultural purposes. There are several mineral springs, recognized for their therapeutic value. Some have been developed with facilities for bathing and/or accommodation, namely Milk River Bath, Bath Fountain, the Spa at Couples Sans Souci and the Rockfort Mineral Bath. Others remain little-known gems in communities across the island. For centuries, Jamaica has welcomed settlers from all around the world. This small island has played host to the Amerindians who discovered it, to Europeans who fought to own it, to Africans forced to call it home, and to Asians, Indians and Middle Easterners searching for a better life. Each group carried with it a story and tradition, throwing everything into Jamaica's melting pot. After centuries of brewing, all have blended together to give the island its rich history and heritage, cultures and customs. Jamaica’s first inhabitants were the Tainos, an Arawak-speaking people, believed to be originally from South America. Columbus first visited the island in 1494. During the 1650s, the British captured Jamaica from the Spanish. Under British rule, Jamaica became a busy and wealthy colony. This success came at great cost to the African people, thousands of whom were forcefully brought to the New World as slaves. As a result of the cruel and oppressive slavery system, Jamaica had more revolts than other West Indian islands. Anti-slavery sentiments grew strong and culminated in full emancipation in 1838. In 1866, the island implemented the crown colony system of government and in 1962 became independent from Britain. Jamaica debuted in Miss World 1959 and won the title three times with: Carol Joan Crawford (1963), Cindy Breakspeare (1976) and Lisa Hanna (1993). This year Danielle Crosskill, Miss Jamaica World 2011, will represent her nation in Miss World 2011. The Times of Beauty proudly presents Danielle Crosskill, Miss Jamaica World 2011, in an exclusive interview for our interview series, Meet the Misses. Hello Everyone! My name is Danielle Crosskill. My friends often describe me as a humble, fun loving and charismatic individual who enjoys spending time with her friends and family. I am very determined and passionate about my work and giving back to others. I have several strings to my bow when it comes to professional and social activities. For instance I work in my family business and teach part time at a pre-school, but I want to focus my attention on early childhood education and volunteerism. I like the hustle and bustle of a city but am equally happy sitting in solitude on the beach. I am a lover of people, different cultures, traveling and the arts. I feel truly blessed to be representing my magical island Jamaica in London this year. Oh Jamaica is an incredible place to live. Located in the Caribbean with a population of approximately 2.7 million, Jamaica is known for its exquisite beauty, warmth, rich culture and its outstanding achievements in sports and music. We have achieved so much given our size, and that is largely because we are a competitive group of people with so much to offer. The island is a beautiful mix of beaches rain forest and industrialization. Being Jamaican means the world to me. I am extremely proud to be a part of a nation that has such a strong history and culture and one that has achieved a tremendous amount globally. I am honored to have been given the amazing opportunity to represent my country at the Miss World Finals in London and I am looking forward to sharing everything Jamaican with everyone on this wonderful Journey. I hope to do nothing but my best for my country men and women! Its my Life by Bon Jovi, most describes me because I like to live life to the fullest with no regrets and because I believe that once you want to do something in life you must strive for it. The song speaks about personal empowerment, taking control of your life and being who you are because you only have one life to live. I am a firm believer that one must follow their dreams and be confident that they can achieve anything they put their minds to. Well a typical week day since I have been crowned Miss Jamaica is rather busy. It all begins at about 7:30am when I wake up and get ready for work with a cup of tea and some cereal. A 15 minute drive to work brings me into contact with the hustle and bustle of early morning Kingston. Work consists of teaching Spanish to pre-schooler children for an hour and then I'm off to my regular 9- 5 which is my family's manufacturing business. Somewhere in between my busy day I also undertake Miss Jamaica duties I may have. At about 4:00 I go to the gym for a rejuvenating work out. Two hours later I'm on my way home. I usually end my day with dinner and a movie or hanging with friends and family. Wow, ten years is quite some time, but that’s okay because I have a number of goals ;) These include, having a family of my own, being influential in the expansion of my family's manufacturing business, hosting several of my own art exhibitions and lastly owning and operating my own learning institution. I most admire Olympic Gold Medalist Usain Bolt because he is a national inspiration and a patriotic Jamaican who has come from very humble beginnings but is a living example that ambition, hard work and dedication does pays off. I absolutely love my little island however if I could choose another country to live in it would be France. Although I enjoy island living I also appreciate the European way of life and particularly France because I think it is a beautiful, charming place and I just love the food and the culture. Whilst I believe that we need to reduce the dependence on oil, I am not in favor of the use of nuclear energy. I believe it is important to explore other avenues such as solar energy, wind, hydro and biofuels which are safer for the environment and human beings. I believe the worst kind of human injustice today is discrimination which comes in many forms such as racism, sexism, religious beliefs, just to name a few. In today's world it is extremely unfortunate considering all of the advancements that we still face many of the prejudices that still exist in society. 11. What are your duties as Miss Jamaica World? My main role as Miss Jamaica is to be an ambassador for my country and to promote brand Jamaica wherever I may be. My other duties include promoting goodwill and encouraging charity work to help the less fortunate as well as being a role model to young women and children. I was only recently crowned in September and so far some of my duties have involved media interviews and a couple of public appearances. However my platform is early childhood education and volunteerism and so of my own accord I have visited schools to promote the importance of a sound education as well as I continue my weekly visits to a children's home. Oh, social media definitely plays a huge role. I have been able to interact with my fans on a daily basis, spread awareness about my interests as well as keeping my fellow Jamaicans up to date with my activities. As a result I believe Jamaicans have a much more vested interest in the Miss World finals this year. It means trying to attain a certain quality of life that for the most part will make you happy and successful and put you in a position to impact other people's happiness. My purpose in life is to be the best 'version' of myself that I can be. And simply to teach and pass on knowledge to others and hopefully shape a better society. Lastly, I would like to help others that are less fortunate than I am. Well it may sound a bit clichéd but I am truly looking forward to meeting the other girls in the Miss World Finals. One of my passions is traveling and during this competition I have the chance to find out about so many different cultures. Also, I hope this interview has been both informative and interesting for you. I would like to thank all who have been so supportive and encouraging throughout my journey thus far. I am truly grateful. Greece is located in southeastern Europe, on the southern end of the Balkan Peninsula; it lies at the meeting point of three continents – Europe, Asia and Africa. Greece borders to the north on Bulgaria and the Former Yugoslav Republic of Macedonia, to the northwest on Albania, to the northeast on Turkey; to the west it is washed by the Ionian Sea; to the south by the Mediterranean Sea and to the east by the Aegean Sea. The total area of Greece is 131,957 square kilometers and consists of three main geographic areas. A peninsular mainland -that extends from the region of Central Greece on the South to the region of Thrace on the North- being the biggest geographic feature of the country. The Peloponnese peninsula that is separated from the mainland by the canal of the Corinth Isthmus, and around 6.000 islands and islets, scattered in the Aegean and Ionian Sea, most of them grouped in clusters, that constitute the unique Greek archipelago. Crete, Rhodes, Corfu, the Dodecanese and the Cyclades are some of the famous and popular islands and island clusters in Greece. Eighty percent of the country consists of mountains or hills, making Greece one of the most mountainous countries of Europe; furthermore, it has 16.000 kilometers of coastline of which 7500 are found around the thousands islands of the Greek archipelago, a truly unparalleled phenomenon on the European continent. Little is known to date to the Paleolithic Era in Greece, but quite a lot is known about the Neolithic Period that followed and its civilization, which is traced mainly in areas that included Thessaly and Macedonia. Civilizations with impressive achievements developed during the Bronze Age in the Northeastern Aegean, the Cyclades, Crete and the Greek Mainland. The civilizations that flourished during the 2nd Millennium in the two regions, known as the Minoan and the Mycenean Periods respectively, are considered to be the first of the great civilizations in Greece. Architectural remains, as well as pottery work, stone carving, metallurgy, jewelry making and murals were impressive and representative works of these civilizations. During the historical years, the civilizations of the Geometric Period and the Archaic Period were considered to be the forerunners of the culture found in the Classical Period. The Classical works of art, with their ideal proportions and beauty, expressed the philosophical ideals of their times, and were the model of the European Renaissance Era of the 15th Century A.D. Greek civilization developed during the subsequent Hellenistic Years and the Roman Years, within the framework of large kingdoms and an empire respectively. Greek civilization again flourished -within the framework of an empire- during the Byzantine Years, while civilization in more recent times was marked by the Ottoman occupation and the emergence of the new Hellenic State after the Greek War of Independence in the 1800s. Greece debuted in Miss World 1953 and produced a winner in 1996 with Irene Skliva. 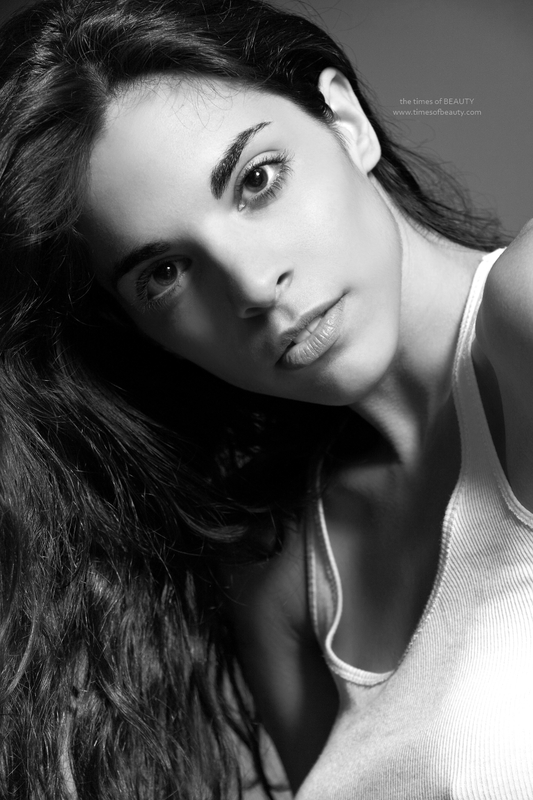 This year, the land of Gods will be represented by Eleni Miariti, Miss World Greece 2011. The Times of Beauty proudly presents Eleni Miariti, Miss World Greece 2011, in an exclusive interview for our interview series, Meet the Misses. I am 21 years old and I live in Athens. I am a model and my experiences from this work are magnificent and I hope for more! I study Law at the University of Athens. 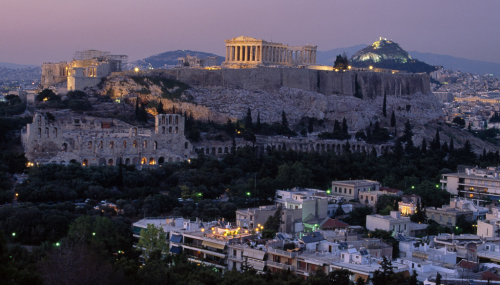 Studying at the University of Athens is hard, but very rewarding. I put a lot of effort and do my best for the future. I like painting and dancing and I am taking acting lessons. These are ways of expressing myself. I love my country and I am very proud of it due to its past and history with which I grew up with. My country at this moment is in a crisis but I am hopeful and expect a better future. Difficulties make us better and smarter. We will overcome this too, as we overcame many problems in the past. My hometown is a little town outside of Athens. It is small, more of a family place and near to the sea which I love! I had the best time there! It is a great honor for me to represent my country at the 61st Miss World finals! 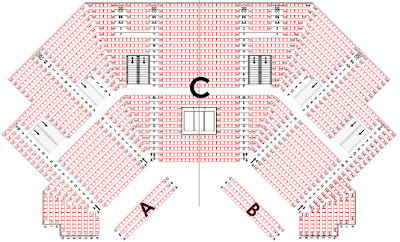 This event is one of the biggest and respected beauty pageants in the world. I am sure that this experience will teach me a lot of things that will make me a better person. I will make new friendships and I will have the opportunity to show to the world that my country has really good and welcoming people! This is a difficult question because I like so many songs - I love music. I would say one song that goes straight to my heart is Old Habits Die Hard by Mick Jagger. I feel that the lyrics are very strong. I try to wake up early! Usually I am working or I have a casting. I go to my University and in the evening I have rehearsals because I am training to be a salsa dancer! Of course every day is different than the other I try to change my program and try to live and experience each day! I would say 10 years is a long time. I am a dreamer and I try to live today and every day to the fullest! I want life to surprise me and the dreams I have to become true. I do not want my life to become a "routine." Ireni Papa and Melina Merkouri are two women I admire for their strong personality their beauty and mind. India and South Africa would be my choices - different and difficult. Every day fighting for life but at the same time I would have the chance to live in the nature - this is in fact the real world. Some people have everything and others have nothing. We have a lot of food but some children die from hunger. This is not fair. The solution for that depends on us to do something. 10. What role can social media (ex. Facebook, Twitter, etc) play in the life of a beauty pageant title-holder? Talking and carrying out a real conversation plays a big role. But today technology plays a big part in everyday life and therefore it is a quick way of communicating with people who share your thoughts and goals, share ideas and act in a higher level. For a beauty pageant titleholder, communication and sharing is an important activity. 11. What does it mean to be a human being? Be an artist in the soul, be fair, be alive be strong, be compassionate. 12. What do you feel is your purpose in life? I try to be better every day and try to make something for everybody to become better humans. This is also a motive behind my wish to be Miss World, as this would give me an opportunity to share my ideas and my thoughts with the people in need and act for them with them. 13. 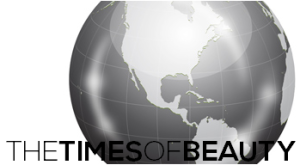 Share a message to your supporters and readers of The Times of Beauty. My friends, I count on your support, please be with me in this wonderful new experience! Help me to be better and I will do my best! Personal Motto: BE STRONG, BE POSITIVE! The life taught me that only like this I can go on successfully. Personal Goal: Be myself and be fair. This is not easy! Personal Dream Destination: Africa and India... Such interesting places. I am sure that eventually I will visit both of them! Favorite Movie: FORREST GUMP! So strong and inspiring movie. Also POCAHONTAS. The story of being free and run in a forest living in the nature fascinates me. Finally, I like so much the film CITY OF GOD as well. Favorite Singer/Band: No one in particular. Favorite Sport: Dancing, jogging and swimming!